First Ascent: 1909 L.L. Delafield, L.M. 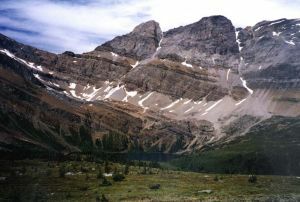 Earle, R. Aemmer, E. Feuz Jr.
1.2 km NNE of Hidden Lake, 1.2 km E of Mt. Richardson, 1 km WNW of Ptarmigan Peak and separated from it by an unnamed peak of lesser elevation. Most who have been to the summit concur that the peak is higher than the official elevation given. Some sources state that it is 10,006 ft/3050 m. The pika (PEE-kah or PIE-kah) is a tiny member of the rabbit family found in alpine areas.